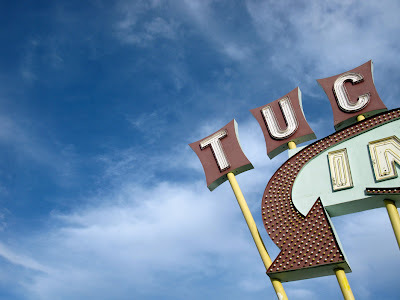 On our way to finding a celebrated Tucson muffler man (watch for a future post), we passed by some eye-popping mid-century signage. 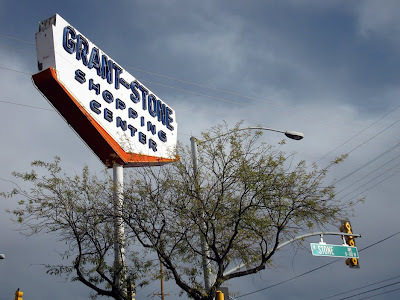 The North Stone area of town must have been a swingin' place, Daddio, back in the early 60s, if the remaining signs are any indication. 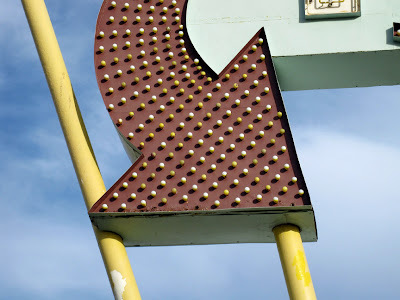 It's always fun to stumble across living bygone road history, when a sign wasn't a sign unless it was neon, buzzing and huge. 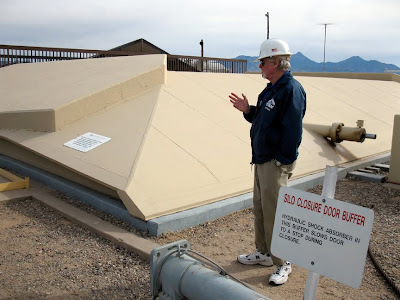 Our tour guide Jim shows us the above-ground silo closure door buffer that would have slid open during a nuclear missile blast. Yikes! 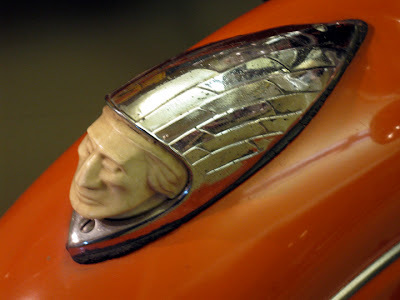 These babies would look great on our Subaru Forester. The high-tech launch control center. This nice lady just blew the Ruskies to kingdom come. 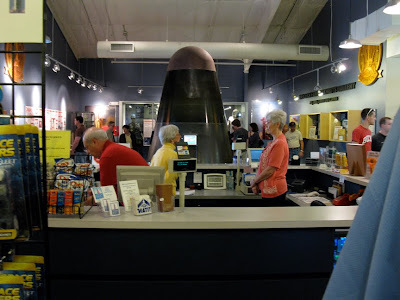 No gift shop should be without a model of a life-size nuclear warhead-carrying missile, I always say. On my Christmas wish list, for sure. 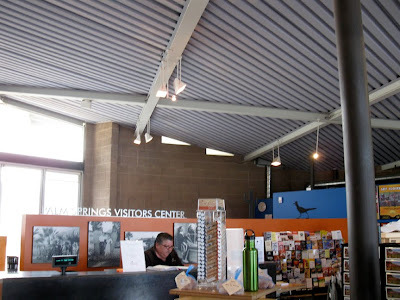 It's not often you get to stare World War III in the face, but a small town south of Tucson, Arizona offers just such a golden opportunity. 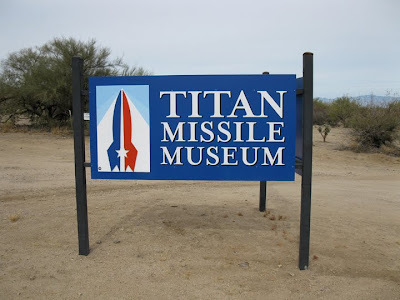 The Titan Missile Museum is the only publicly accessible former ICBM site in our great nation. 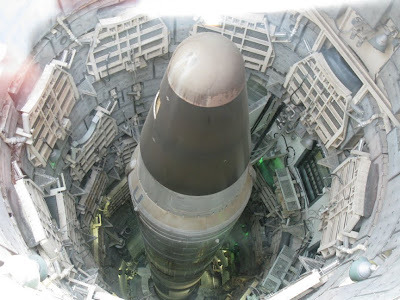 The Titan II, you'll recall, was the rocket ship loaded with a nuclear warhead that was aimed and ready to annihilate our Soviet then-enemies back in the sixties, seventies and early eighties. 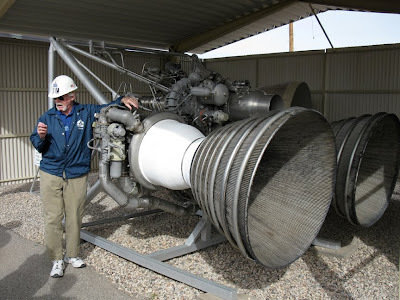 Sahuarita, Arizona was one of three American sites, along with Little Rock, Arkansas and Wichita, Kansas that hosted these underground doomsday machines. The potential of mutual destruction, and a healthy dose of Fail Safe-esque fear, kept the jittery peace in those chilly Cold War days. 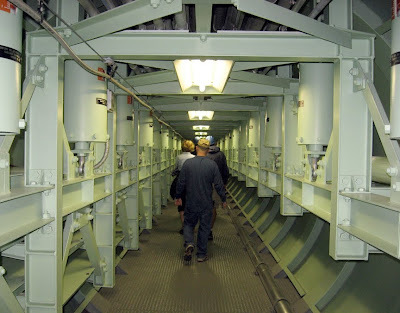 At the museum, you get a nice one-hour tour that shows the above-ground launch-duct area and the really, really thick steel doors that would have rolled open during a missile activation. 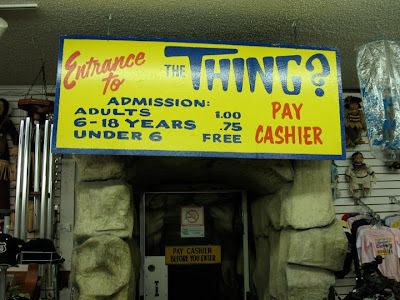 You then descend 35 feet to the underground missile complex area and are treated to a simulated Titan blast where one lucky guest gets to push the make-believe missile launch button. 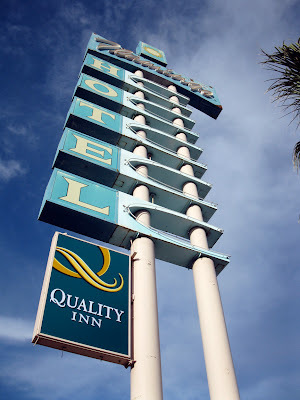 The whole place has a distinctly retro 1960s feel, even though it wasn't decommissioned until 1982. 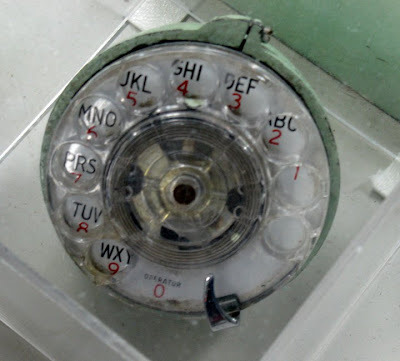 Rotary phones and Dennison tape gun labels are de rigeur and the cast of Dr. Strangelove would not seem out of place here. 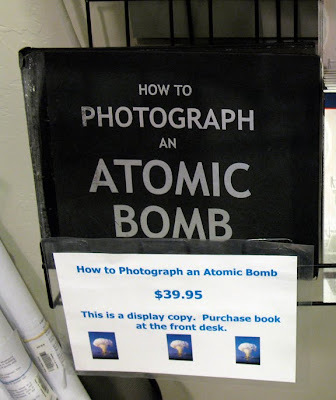 The gift shop has many fine keepsakes including photos of exploding atom bombs that would look lovely in any modern bomb shelter. 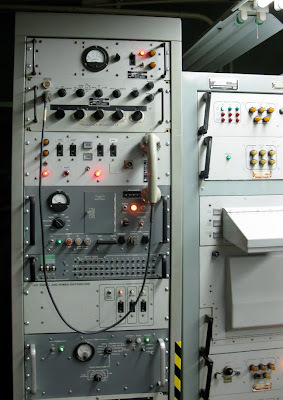 By the way, they don't have any nuclear warheads here, just the decommissioned missile. It's still pretty chilling, though, and you don't have to be a rocket scientist to see that that whole Cold War thingy was no joke. Ain't Nothin' Like the Real "Thing? 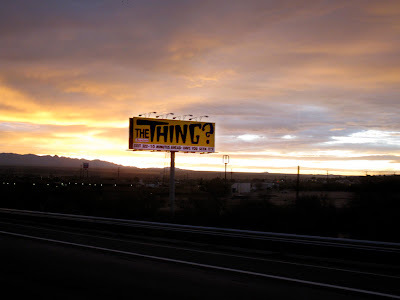 ": Dragoon, Arizona's "The Thing?" 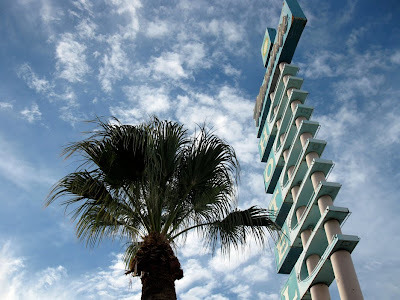 Hundreds of billboards beckon you. The best $1 you'll ever spend. 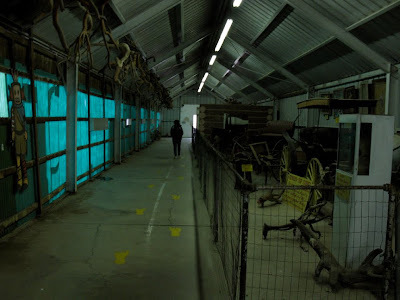 ...all housed in metal outbuildings for your convenience. You decide...they don't tell you. 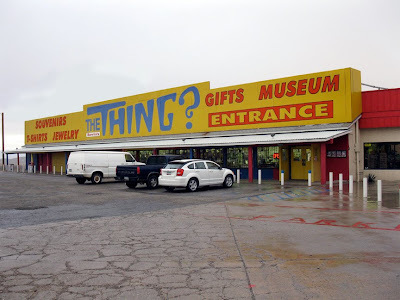 ...they've got some "thing" for everyone. 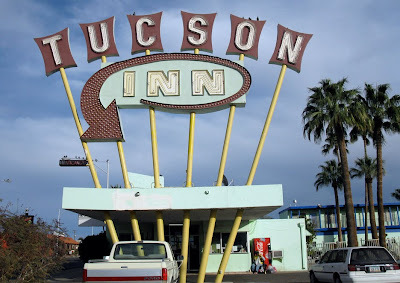 Along a starkly beautiful but rather lonely stretch of Interstate 10 in southern Arizona sits a classic, old fashioned, "Hey Dad, stop the car!" 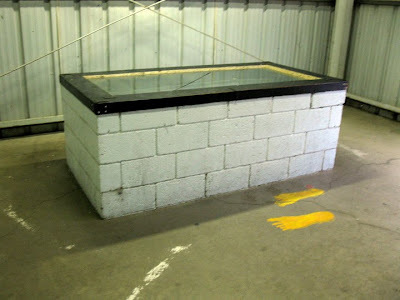 tourist attraction. 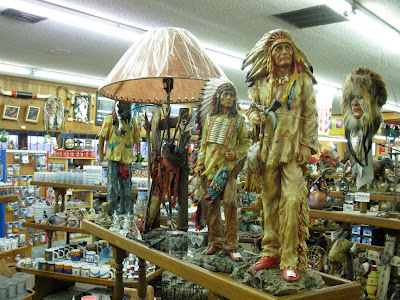 Like South of the Border in South Carolina and Wall Drug in South Dakota, hundreds of billboards get you worked up to a roadside attraction fever pitch by the time you hit exit 322. Three metal shed-like buildings await you behind a large gas station and souvenir shop and for the bargain price of only $1 you can see their ancient and mysterious contents. 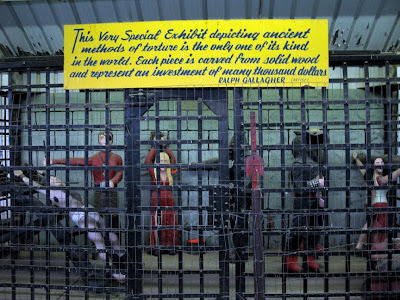 The work of Ralph Gallagher, wood carver extraordinaire, is well represented here, including a "very special exhibit depicting ancient methods of torture" which is "the only one of its kind in the world" and represents "an investment of many thousand dollars." This is worth the eight-bit admission price alone, but wait...there's more! 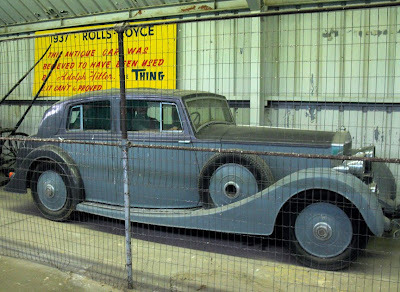 They've got a 1937 Rolls Royce "believed" to have been owned by Adolph Hitler. 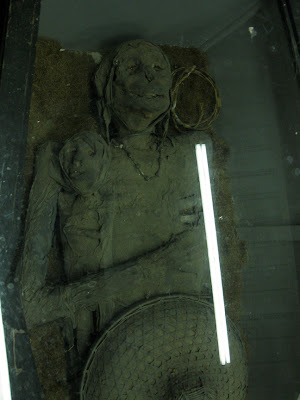 There's other bric-a-brac including some pottery and adding machines behind plexiglas cases, and then, in a brick case nearly at the end of your tour is The Thing?, which **SPOILER ALERT** turns out to be a an adult mummy holding a baby mummy -- a mummy and child reunion, if you will. 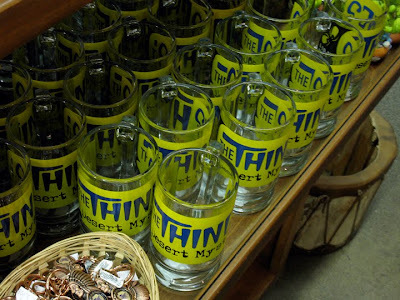 The Thing? 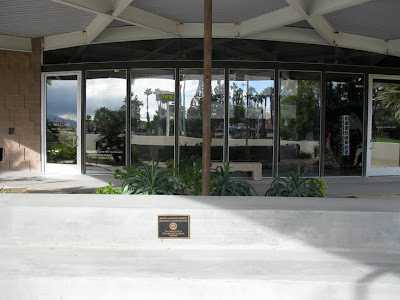 has been around since 1950 and in this spot since 1965 and was the brainchild of Thomas Brinkley Prince, an attorney from California. 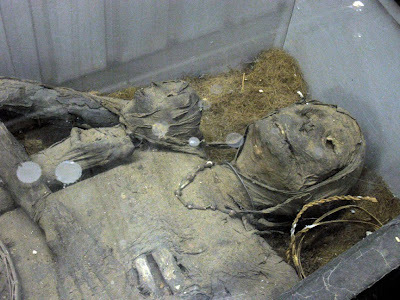 Little information exists to the actual origin of the mummies themselves, though. Perhaps a dreaded curse will be put on the head of he who divulges its ancient and mysterious history. If it's not one Thing?, its another. 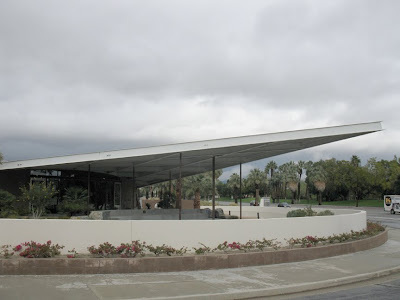 They've got lots of cool architecture books inside. 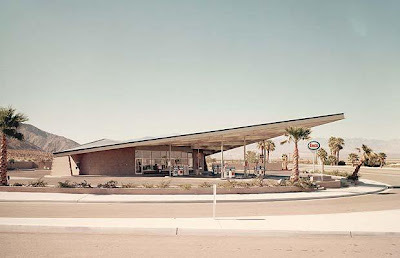 I would have loved to have gotten a fill-up here, back in the day. 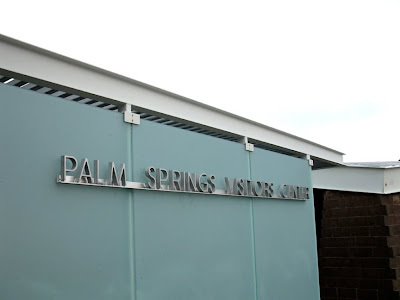 You'd be hard-pressed to find a better location to view fabulous Mid-Century Modern architecture than Palm Springs, California. 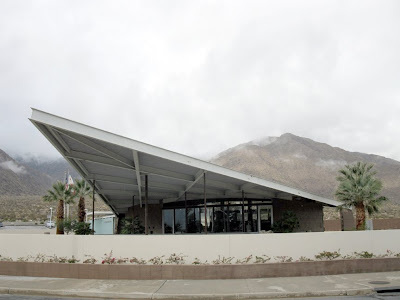 When stars like Bob Hope, Frank Sinatra and Elvis Presley made Palm Springs their desert retreat, they hired big-named architects to build them wild and wonderful futuristic showpieces. 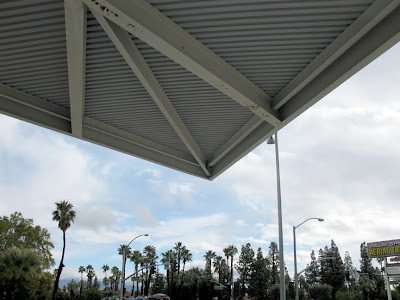 The town was so architecture-conscious that even something as ordinary as a gas station was given the full Googie treatment. 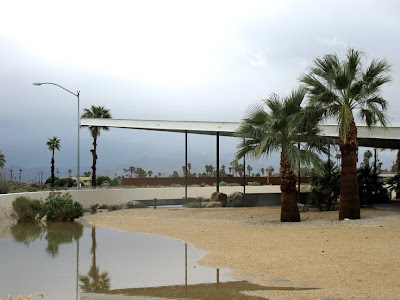 This is the case with the former Enco gas station on Highway 111, which is the current location of the Palm Springs Visitors Center. 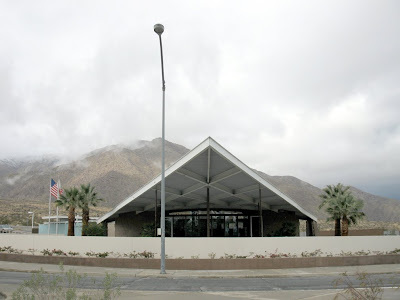 Designed by architects Albert Frey and Robson Chambers and built in 1965, it is a magnificent mid-century marvel, with a hyperbolic paraboloid roof that would be the envy of George Jetson. 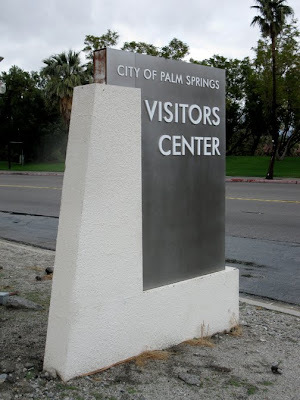 It sits at the entrance to Palm Springs and lets you know this town is a ring-a-ding-ding clambake. 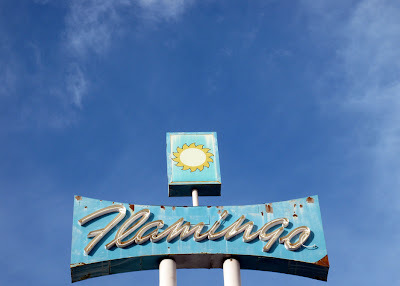 Out of business by the early 1990s, its fate seemed destined for the wrecking ball until it was rescued, first by investors who turned it into an art gallery, and then by the town who treated it to a $500,000 restoration. 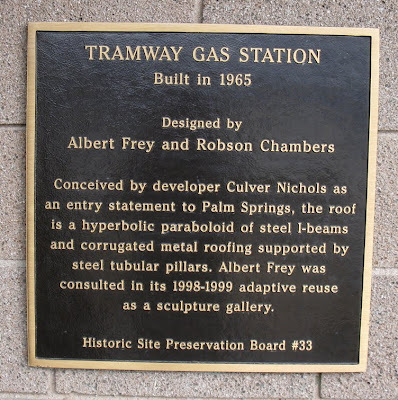 What a beautiful place this is and how great Palm Springs was to recognize it before it was too late. It's a gasser, man, a real gasser. 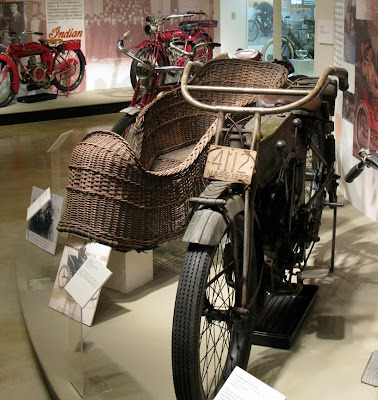 Airbag, shmairbag...put the kids in the wicker sidecar! 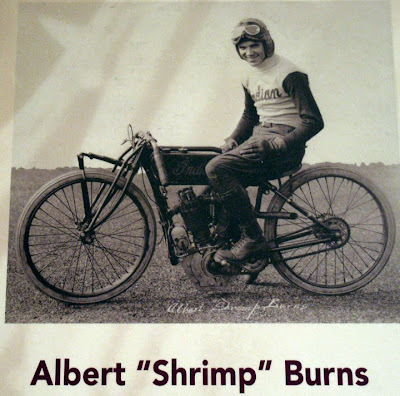 Tell me Albert, what part of the name "Shrimp" do you find demeaning? 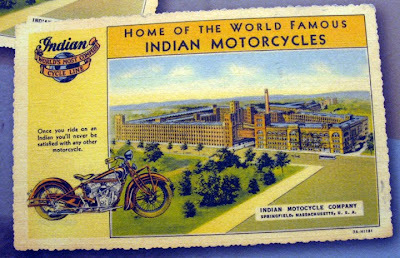 Indian Motorcyles were one of many industries located in bustling Springfield, Mass. 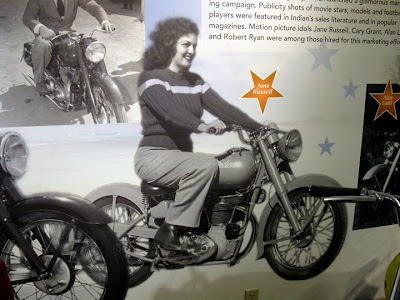 You don't have to be a motorcycle enthusiast to get all revved up about a cool permanent exhibit at the outstanding Museum of Springfield History in Springfield, Massachusetts. 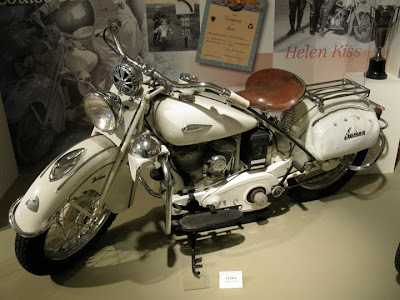 The Esta Manthos Indian Motorcycle Collection features more than two dozen antique motorcycles that were produced by the then-politically-okay-to-be-named Indian Motorcycle Company's huge Springfield factory from 1901-1953. 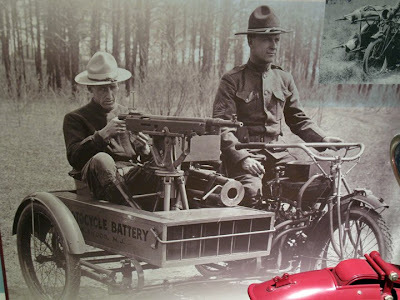 Looking at these magnificent bikes and the crazy things people did with them, you can't help but think that people certainly were a lot tougher 100 years ago than we are today. Seatbelts? 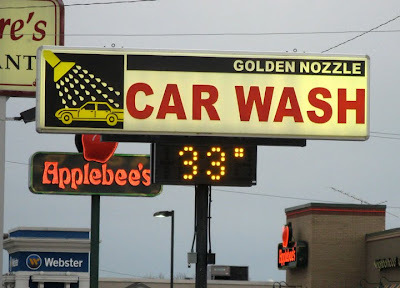 Go fry ice. Airbags? So's your old man. 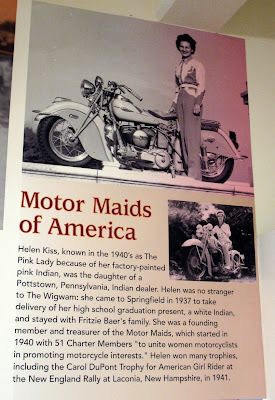 And women were no slouches back then either, as the Motor Maids of America will attest. 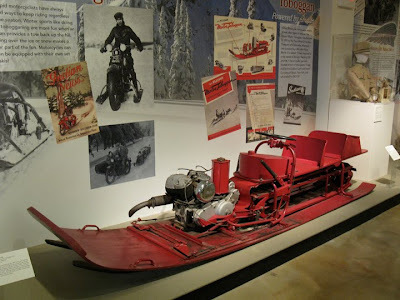 They even had an Indian-motorized toboggan back in 1945. So here's to you, Springfield. 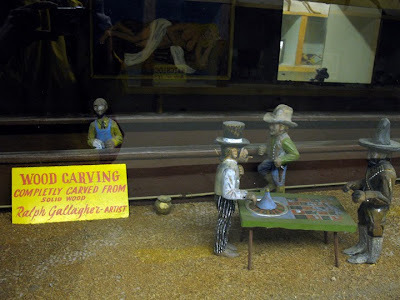 This exhibit is a real feather in your cap.